Nothing in this world can work without energy, same is with Humans. We need energy, and that energy is extracted from the food we eat. That food is synthesized by our body and energy is stored as glucose in blood, glycogen in muscle and fat in adipose tissues. Glycogen is the secondary long term energy stores in our body. Primarily long term energy is stored as fat in adipose tissues. Glycogen is usually stored in muscles and liver. Glycogen stored in muscles help us in our day-to-day activity while liver glycogen help in working of nervous system and internal metabolism. Here we are going to discuss the Glycogen stores of body, which are the actual power-house of human body. Where is glycogen stored in our body ? There are a number of organs where glycogen is stored for urgent usage. Those organs are listed here. Liver: Our liver can store glycogen equivalent to 5-6% of its mass i.e. around 120g in an adult. Its maximum limit can be be up to 10%. Muscles: 1 to 2% of muscle mass consist of glycogen stored in it. But still the total glycogen stored in muscles can be twice of that stored in liver. Its due to comparatively more muscle mass in body. RBC: Red Blood Cell (RBC) store some glycogen to provide enery to different organs. WBC: White Blood Cells are an important part of our immune system and it also stores very little amount of Glycogen. Glial cells in the brain: Our brain needs energy on regular basis to work properly. Glycogen stored in Glial cells of the brain provide that energy instantly. Uterus during pregnancy: Glycogen is stored in uterus during pregnancy to provide instant energy to developing embryo. How is Glycogen used for energy needs? When our body senses the need of energy (as a result of decreased blood glucose level), it releases hormone glucagon which acts on lever glycogen and turns it into glucose. If we talk about energy usage in movement of body then glycogen stores in muscles are used. Initially when we move the Adenosine Triphosphate (ATP), a high energy molecule in muscles is used to get the energy. ATP exhausts within 10 seconds. After that some chemical reactions occur in muscles to convert the muscle glycogen into glucose and then ATP. Can we increase our muscle glycogen storage? Yes, intramuscular glycogen storage can be increased if we exercise and do physical training on regular basis. Our body adjusts the storage capacity if it finds that we need more glycogen on regular basis. But it can't be increases just by exercising for a few weeks. It takes time to develop more glycogen storage capacity. 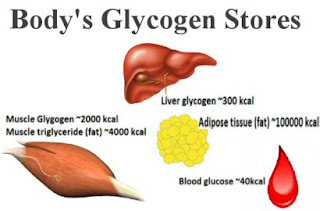 When our body experience glycogen depletion, a stage where all glycogen stores are depleted, then our body starts increasing glycogen storage capacity. Glycogen Depletion, also known as hitting-the-wall, occurs most often with marathon runners, cross-country athletes and cyclists. Some endurance training programs can also help in increasing the capacity. An average person can store about 1,500-2,000 calories as stored glycogen. When our glycogen stores are completely filled we have around 500g of glycogen, 100g in liver and 400 in muscle tissues. Liver is responsible for blood glucose level between meals. Its done with the help of glycogen stored in it. The process of conversion of glycogen into glucose is known as Glycosis.